Introduction. 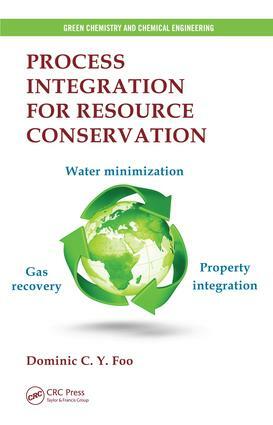 Data Extraction for Resource Conservation. INSIGHT-BASED PINCH ANALYSIS TECHNIQUES: Graphical Targeting Techniques for Direct Reuse/Recycle. Algebraic Targeting Techniques for Direct Reuse/Recycle. Process Changes for Resource Conservation Networks. Algebraic Targeting Approach for Material Regeneration Networks. Network Design and Evolution Techniques. Targeting for Waste Treatment and Total Material Networks. Synthesis of Pretreatment Network. Synthesis of Inter-Plant Resource Conservation Networks. Synthesis of Batch Material Networks. MATHEMATICAL OPTIMIZATION TECHNIQUES: Synthesis of Resource Conservation Networks: A Superstructural Approach. Automated Targeting Model for Direct Reuse/Recycle Networks. Automated Targeting Model for Material Regeneration and Pretreatment Networks. Automated Targeting Model for Waste Treatment and Total Material Networks. Automated Targeting Model for Inter-Plant Resource Conservation Networks. Automated Targeting Model for Batch Material Networks. Appendix. Index. Dominic C.Y. Foo, Ph.D., P.E., is a Professor of Process Design and Integration and the founding director of the Centre of Excellence for Green Technologies at the University of Nottingham Malaysia Campus. Professor Foo has authored more than 70 journal papers and made more than 120 conference presentations. He has been a recipient of the Innovator of the Year Award from the Institution of Chemical Engineers UK (IChemE) and the Young Engineer Award from the Institution of Engineers Malaysia (IEM).